In the morning when I get on the elevator up to my office in GPO headquarters, when they aren’t talking about sports, everyone is chatting about the weather. My colleagues compare the day’s weather with previous years and talk about what’s coming in the days and seasons ahead. Since Washington, DC’s weather varies greatly throughout the year (even through the day! ), people in this area are always taking the pulse of the outdoors and our world. In a similar vein, the Department of Commerce’s National Oceanic and Atmospheric Administration or NOAA, the U.S. Government’s oldest scientific agency, is taking the pulse of the Earth, for our benefit. Click here to “Explore NOAA” in this movie about the Nation’s oldest scientific agency. NOAA says that “Our reach goes from the surface of the sun to the depths of the ocean floor as we work to keep citizens informed of the changing environment around them.” As such, its mission is to understand and predict changes in climate, weather, oceans, and coasts, and to conserve and manage coastal and marine ecosystems and resources. Once they’ve taken the Earth’s pulse, of course NOAA wants to share the output of their studies. The data the agency gathers when studying the Earth’s atmosphere and oceans is comprehensive, and it is a global leader in communicating how Earth’s atmosphere and water systems influence people’s lives and how they influence those systems. If you learn how to navigate the range of NOAA’s free online resources, including real-time and archived information, you will get the full benefit of this rich data. NOAA educates and disseminates data from its many valuable services, including the National Marine Fisheries Service, the National Ocean Service, the National Weather Service and others. Their information comes packaged in videos, weather alerts, digital coastal charts, entire databases, atlases, podcasts, screensavers, sea sounds, field reports, tagging data, and an entire education Web site for teachers and kids. NOAA has resources for children that are as unique and valuable as their science. For instance, NOAA’s Weather Systems and Patterns page has a multimedia, lessons and activities, real world data, background information and career profiles. A student who is interested in extreme weather can graph tornado air pressure in the lessons section, investigate the severe weather events page in the real world data, track a storm in the multimedia section, read the background on severe weather, and even flirt with future career possibilities in the career profile of the tornado chaser. If the student wants to follow up with extra reading at home with advice for the whole family, Watch out– Storms Ahead! Owlie Skywarn’s Weather Book can help round out the lesson. Total immersion in a topic is possible without ever leaving the site. Free resources for teachers and students is a bonus that teachers, parents, caregivers and students should take full advantage of, and NOAA’s Education Resources page is a just one prime example what the agency’s got on offer for the American people. Another instance of NOAA’s rich resources is its coastal maps. NOAA’s Office of Coast Survey recently announced that they were no longer issuing printed U.S. Coastal maps; instead, they now make high-resolution Raster Navigational Charts for public use. The Office of Coast Survey offers over high quality, 400 dpi full-color digital images of NOAA’s entire suite of paper charts, for download and printing. Sailors, commercial fisherman, and anyone else interested can view and print these charts as well as the free demo software to use them; this is data of high commercial value available completely for free for the American people as well. Note that up-to-date, printed US Government astronomical, air and nautical navigational charts and almanacs are still available from the US Government Bookstore under Transportation & Navigation > Almanacs & Navigation Guides. Librarians and Teachers: Attending tomorrow’s joint NOAA-GPO webinar, “Discover Your World With NOAA: Learn How NOAA Monitors the Pulse of the Earth, and How to Access and Use NOAA’s Free Online Resources” is a great way you can learn to reap the benefit of NOAA’s rich data offerings. Registration for this free training webinar is available now. It will be offered Wednesday, November 13 at 2 p.m. Eastern Time; GPO’s Library Services & Content Management Division (LSCM) will archive the session on the free GPO Webinar Archive for those who cannot attend. Hopefully you can make it to the live webinar or find some time to look at the archived webinar after it takes place. How can I obtain these NOAA publications? Shop Online: You can purchase these publications from the U.S. Government Online Bookstore at http://bookstore.gpo.gov by clicking on the links above in this blog post or clicking here to shop our entire NOAA collection. Librarians can find the records for these publications in GPO’s Catalog of Government Publications or CGP. Register for the free GPO-NOAA Free Online Resources training webinar offered Wednesday, November 13 at 2 p.m. Eastern Time, or view it later on the free GPO Webinar Archive. About the author(s): Adapted by Government Book Talk Editor-in-Chief and the US Government Printing Office (GPO) Promotions & Ecommerce Manager, Michele Bartram, from an original blog post by Jennifer K. Davis from GPO’s Library Services & Content Management Division that supports the Federal Depository Libraries Program (FDLP). Two publications show us the way… to care for trees this Arbor Day! With Earth Day yesterday and Arbor Day this Friday, April 26, and all week as National Parks Week, this is the perfect time to do something to help a tree grow or plant something new to celebrate the miracle of spring. If there are little ones in your life—children, grandchildren, nieces, nephews or friends of kids that you love—it’s a good time to teach them to love trees, plants, and flowers, too. The best way to get kids to appreciate nature, according to Dr. Seuss’ The Lorax Curriculum Guide, is to take them outdoors—and “according to the Institute for Social Research at the University of Michigan, children in the U.S. spend 50% less time outdoors than they did 20 years ago.” To counter the initial cries of “I want TV”, however, it helps to give kids directed activities when they go outside. 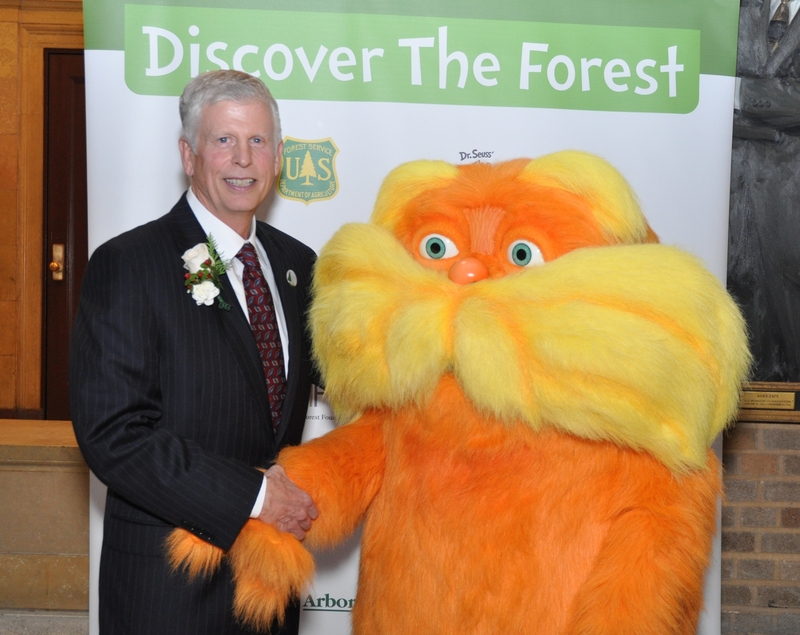 The U.S. Forest Service and the Ad Council have developed a partnership with Project Learning Tree and Universal Pictures to create an educational curriculum plan based on “The Lorax” film and story. The curriculum supports the Forest Service’s “Discover the Forest” campaign (See image caption above). 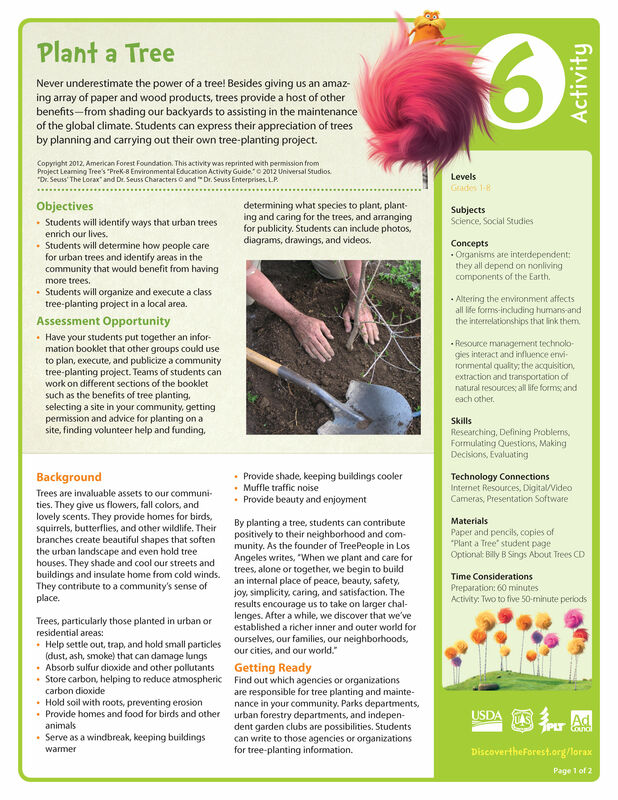 Image: “Plant a Tree” page 21 from the Lorax Classroom Guide. Teachers can download for FREE the complete classroom guide of Dr. Seuss’ The Lorax Curriculum Guide as a PDF, or can download the individual activities to use in class (as long as it is for educational, and not commercial, purposes). There’s an interactive map of places you can go in the United States that have campgrounds, national forests, state campgrounds, etc. There’s a page of games and activities such as how to use a compass, take a virtual hike, create a leaf rubbing or become a Jr. Forest Ranger on the Web site. The printed teacher’s guide has tests, bibliographies for the students, labs (plant a tree with the Lorax), and student pages for various grade levels (I saw K-4 and 6-8). Families are encouraged to use these activities, too. Why would Anyone Cut a Tree Down? continues the ecological and conservation-minded discussion you might want to pursue with your kids or students this week. However, this volume approaches conservation from a silvicultural perspective, rather than the Lorax’ perspective of promoting a child’s approach of nature generally. The age range for the publication is 8 and up, and the material might be a bit young for older middle school children—so its material is more directed to a specific age range. The Forest Service published this document also, and the authors are a writer/ editor / educator with the Forest Service and an illustrator with previous experience illustrating tree guides. The book shows children the life cycle of trees, the need to remove sick trees, the uses for wood from cut trees, and types of trees that are dangerous, all so beautifully illustrated by Juliette Watts that they make the lessons come alive. Purchase a copy from the GPO U.S. Government Online Bookstore, and flop under a tree canopy to read the story and appreciate all the gifts that nature has to give us. As Dr. Seuss wrote, “Now that you’re here, the word of the Lorax seems perfectly clear. UNLESS someone like you cares a whole awful lot, nothing is going to get better. It’s not.” It’s up to us (and the Forest Service and its partners) to encourage children to care a whole awful lot about our trees and forests. Using these publications is good a way to make that happen! How can I find these publications? Locate it through GPO’s Catalog of Government Publications CGP catalog record. GPO has cataloged both the print and the electronic versions to make things “a whole awful lot better” for the Federal Depository libraries that got it in the April 2013 record load. Find it in a federal depository library near you. 2) Why would Anyone Cut a Tree Down? Purchase it on GPO’s U.S. Government Online Bookstore. Buy it at GPO’s Main (retail) Bookstore at 710 North Capitol Street NW, Washington, DC 20401, open Monday-Friday, 8:30am to 4pm Eastern Time, except Federal holidays. Call (202) 512-0132 for information. Adapted by Government Book Talk Editor and U.S. Government Online Bookstore Manager Michele Bartram from a post written for the FDLP Community Blog by guest blogger Jennifer Davis from GPO’s Library Services & Content Management Division that supports the Federal Depository Libraries Program (FDLP).